When I turned 48 I hadn’t been training all that long, wasn’t in great shape, and my ukemi was way less efficient. 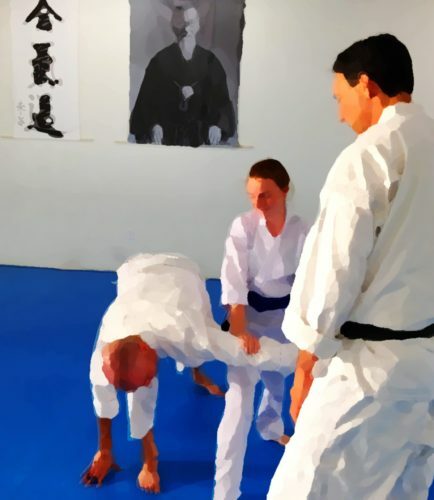 We don’t often do birthday rolls (mostly because people are out doing other things on their birthdays, I think), so I was kind of surprised, and really tickled when at the end of class Sensei called me up. He said “We have a birthday today. Linda Eskin is turning 18!” And I thought “Why you patronizing so-and-so [edited for civility], not expecting as much of me as of other students… Rrrr…” And then he threw me 18 times, and it about half killed me. LOL I saw, and appreciated, the wisdom in what he’d done, bless his heart. But then afterword he said “And next year she’ll be turning 17!” And I thought, “Why you…. No way. That’s just not cool.” It sure as hell wasn’t in my plans to get weaker and less capable over time. But I knew in one year, which goes by pretty quickly, I probably wouldn’t be able to do 49, so right then and there I made it my goal, and told him so, that I would be able to do 50 rolls on my 50th birthday (which was on a class day – yes, I checked, two years ago). I’ve kept that goal in mind this whole time, working on getting the effortful spots out of my rolls as best I can, training for endurance, and taking really good care of myself (icing injuries, doing my PT exercises, etc.). With my birthday fast approaching I did some extra cardio work, and tried a few sets of 20 or so at a time, to prepare and check myself. On Tuesday I wrenched my knee, and iced, massaged, and stretched like mad for two days. Yesterday I woke up with it feeling fine. I wasn’t sure I could do it. 100 in a class, yeah, but 50 in a row, I didn’t know. I was a little freaked out earlier in the week that I might have to give up partway through, and would look like an idiot in front of everybody. I examined my egoic attachment to even attempting it, and tried to keep the whole thing in perspective. But dammit, it was something I said I was going to be able to do, and I really wanted to know if I actually could. I’m actually really proud of myself that I was able to achieve a physical goal like that, having never even attempted something like a 5K run. Many thanks to Sensei and my very kind and patient fellow students for putting up with my silliness. And now, back to training.